University of Lynchburg is one of the nation’s best institutions for undergraduate education, according to The Princeton Review’s 2015 edition, The Best 379 Colleges. Only about 15 percent of the 2,500 four-year colleges in America are selected for this guide. The rankings are based on surveys of 130,000 students (average 343 per campus). 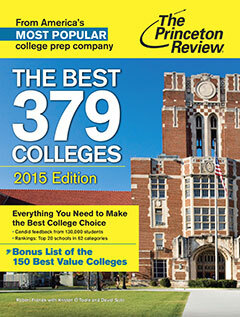 Annually published since 1992, “The Best 379 Colleges” is one of 150 Random House / Princeton Review books. No school has ever paid a fee to be profiled in the book. The Princeton Review is an education services company known for its test-prep courses, tutoring, books, and other student resources.